St John the Evangelist, one of the two Hal Millieri chapels, will be opened to the public on Sunday, feast of the Annunciation. The feast of the Annunciation of the Virgin at the mediaeval chapel of Hal Millieri, limits of Zurrieq, will be celebrated on Sunday. For the occasion, the chapel will be open to the public from 9 a.m. to 6 p.m.
Mass will be celebrated at 10 a.m., followed by the blessing of the burials inside the chapel and the adjoining church-yards. 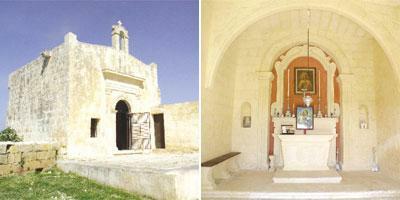 Din l-Art Helwa, the volunteer heritage organisation that holds the chapel in trust, will be holding two guided tours of the site by volunteer historians Stanley Farrugia Randon at 11 a.m. and Salvator Mousù at 3 p.m.
Din l-Art Helwa said the chapel of the Annunciation at Hal Millieri is the most important historical monument from Malta's medieval past. The present edifice dates to around 1450 and excavations have shown it to be built over the site of an earlier, possibly 13th century chapel, and a much older late-Roman rural complex. The chapel is best known for its medieval architectural elements and more so for the unique set of frescoes that adorn its side walls between the springing of the arches. The anachronistic cycle of effigies of saints, which is believed to have been copied from the earlier primitive chapel, have been restored through the efforts of Din l-Art Helwa as Malta's best example of medieval vernacular religious art. This year the nearby chapel of St John the Evangelist, also restored by Din l-Art Helwa. will be open on the occasion. The Hal Millieri chapels are best reached either via Zurrieq by taking the first right hand turn after leaving the Blue Grotto Avenue fountain roundabout, or down Diamond Jubilee Square on the Mqabba bypass.